If i had to pick the biggest problem for the Yankees this season, it certainly wouldn’t be the pitching. The offense has been the issue of late, and injuries have been an issue all year long, but the pitching has been, at worst, still pretty solid. When a team wins 87 games, they’re only a couple of lucky bounces away from being a potential World Series favorite. Despite the solid pitching, the Yankees can still improve the rotation, and there’s no reason to think they shouldn’t go after an arm on the market this offseason. 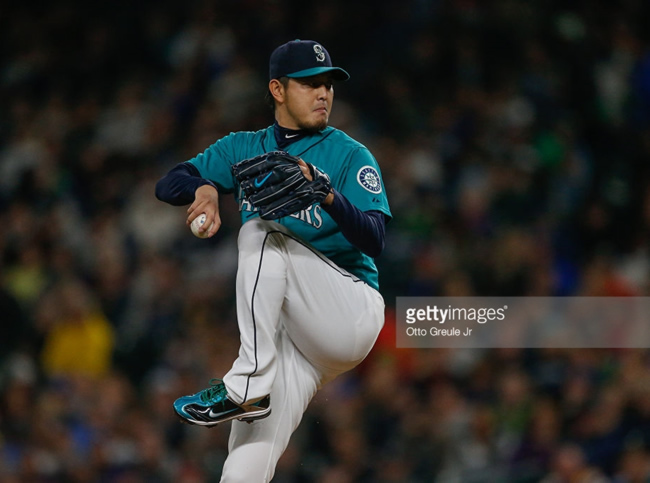 I think that arm could be the one attached to impending free agent Hisashi Iwakuma. First, let’s get a little background on veteran, who will turn 35 at the beginning of next season. He was born in Tokyo, and spent eleven season playing in the JPPL – four years for the Kintetsu Buffaloes, and seven for the Rakuten Golden Eagles. In 2011, he was a teammate of former big leaguers Akinori Iwamura and Kaz Matuis (among others), former Yankees Darrell Rasner and Romulo Sanchez, and current Yankees ace Masahiro Tanaka. 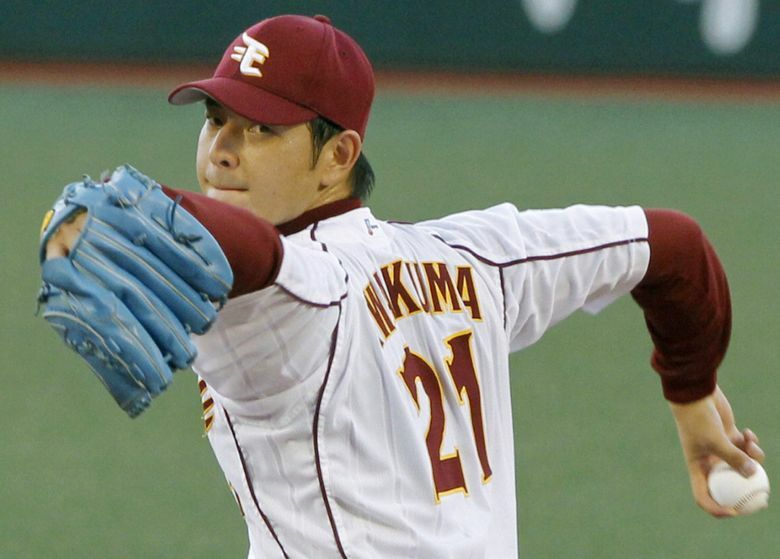 Over his eleven years in the JPPL, Iwakuma made 225 starts and had a record of 107-69, an ERA of 3.63 and a WHIP of 1.204, even winning the Eiji Sawamura Award in 2008. Rakuten posted him after the 2010 season, but he was unable to reach an agreement with the bid-winning Oakland A’s, and ended up signing with the Mariners for $1.5 Million guaranteed ($3.4 Million additional in potential incentives) in 2011. He wasn’t an immediate sensation with the Mariners, as he started in their bullpen and was the last player who made the opening day roster to even get in a game. Once Seattle actually let him pitch, they found out he was a good hand. He signed a two-year extension (with a third-year option) after the season and became a staple of their rotation over the next few years. He made the All-Star team in 2013, finishing with a 14-6 record and a 2.66 ERA (3.44 FIP). He enters free agency after a pretty solid four-year run with the Mariners, during which he pitched in 111 games (97 starts) and went 47-25 with a 3.17 ERA (3.62 FIP) and a 1.082 WHIP. Not too shabby. He even pitched a no-hitter this year, the fifth in Mariners’ history (Randy Johnson, Chris Bosio, Felix Hernandez and Kevin Millwood and a bunch of relievers have the other four) and only the second ever by a Japanese-born player. There’s not much negative you can say about Iwakumi, but he does have a bit of a history of injuries. In the mid-2000s in Japan, he suffered through some pretty significant shoulder troubles, starting in 2005, when he pitched with shoulder discomfort all year long and finished last in ERA among qualified pitchers. He missed the first half of the 2006 season while rehabbing the shoulder, and missed time in 2007 with back and oblique injuries. He also had arthroscopic elbow surgery after that season. He’s dealt with some injuries at the big league level as well, straining a tendon in his finger during the spring of 2014 and a lat muscle earlier this season. At 35, with his history, he might pose some kind of risk, but it doesn’t seem as though he’s suffered through any major shoulder or elbow surgeries, which would be a larger concern. As with any other potential free agent, it’s all going to come down to how much money the Yankees are willing to give him, and over how many years. Because Iwakuma is going to be 35, no team should be looking to give him a four or five year commitment. Ideally, the Yankees would give Iwakuma two years, and he’d be out the door before turning 37. However, the market being what it is these days, it is likely he would receive at least one three-year offer. Perhaps the Yankees could get away with offering up a little extra cash over the two year deal, with a team option for a third year. I think they could comfortably make an offer of two years and $30 Million. It would be a little more per season than they would ideally want to pay, but they could save a year on the deal. This is similar to the strategy they used with Hiroki Kuroda when they signed him for the 2012 and 2013 seasons. They paid Kuroda a little bit over market value, but were able to bring him back on one-year deals, instead of lengthier contracts. Iwakuma certainly isn’t the only option on the market, but he’s a very attractive one. He’s been a very good pitcher in the majors for a few years now, ideally wouldn’t require a long contract and he was already teammates with Masahiro Tanaka once. Would he want to come to New York? The flight home to Japan is made much easier by playing on the West Coast, sure, but plenty of Japanese pitchers have not let that dissuade their decisions before. I wouldn’t put too much stock in the East vs. West argument. At the end of the day, I think Iwakuma is going to go to the place where the money and the chance to win best combine. The Yankees boast a solid bullpen (even with the middle innings being sometimes hard to get through), a solid rotation with youth mostly on their side (save Sabathia and a would be Iwakuma), and an offense that has already started breaking in the next generation, and could break in even more of it next year. I think the Yankees will be a very attractive option to a lot of players this offseason and, if they’re not going to go after any major players on the free agent market, I would love to see the Yankees bring Iwakuma in if the price is right.